The UCI posted, today, changes to its rules and regulations for cyclocross. The hot-button item is the new radio rule for World Cup and World Championship races (although as written, it is limited. Communication allowed only from the rider to the mechanic. No communication from staff to rider). But there’s more. The u-turn returns, as long as there is no picket fence swinging by riders, and staff for world cup and world champs need UCI licenses [Editor’s note: After talking to a few people who know more than me, I think the rule from last year will remain intact. This is just a bad translation. So expect to see the triangles return.] 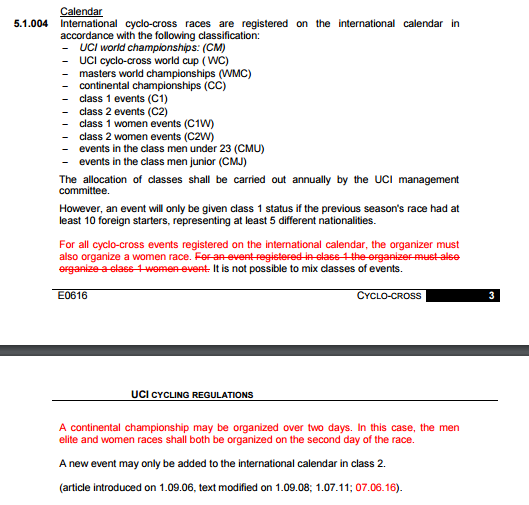 I’ve pulled out all of the changes, which were approved June 7 by the UCI Management Commission, and listed them below. I’ve also uploaded the full cyclocross chapter here: 5CRO-E-07.06.2016_English. Does requirement to have 10 foreign starters from 5 nations put US C1 races @ risk? Does that include all races, or just elite fields? This isn’t a new rule and one that has not been enforced in the U.S. I believe North America has received dispensation since it is geographically difficult to fulfill the requirement. 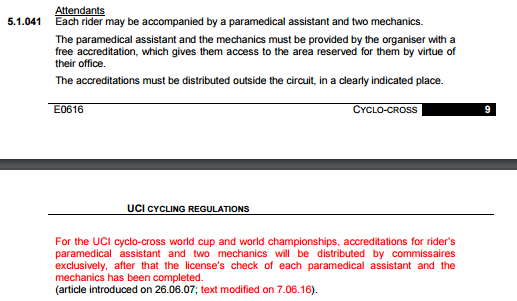 However, if the UCI wanted to enforce, it could be hardship for many US C1 races. Do these rules only apply to C1 races in the US and not C2s? I really don’t understand the different levels of classification for races. Maybe the topic of a future podcast. For example all World Cup and national championship races are C1 but not all C1 races are World Cups or national championships, right? World Cups are above C1s, separate category. It is a good topic for another show. The radio and fees rules only apply to World Cup and World Championship races. 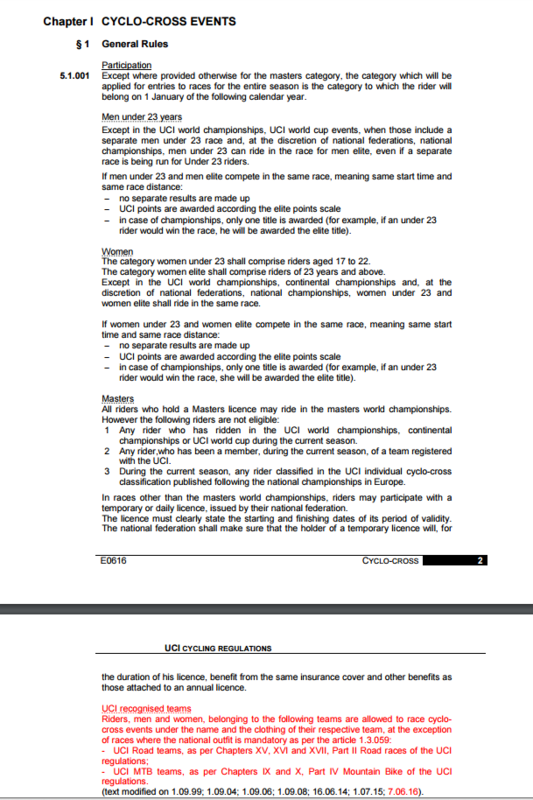 The other rules discussed apply to all UCI races including C1s and C2. Previous Previous post: Crosshairs Radio ep 32: Dekker! Richards! Meeusen! Powers! AusCX!